The historic Merwinsville Hotel in the Gaylordsville section of New Milford, a testament to the era when the railroads were king, presents the final weekend of its annual Christmas/holiday show Dec. 2, 3, and 4. A display in the holiday show at the Merwinsville Hotel. Photo from the Facebook page of the Merwinsville Hotel Restoration, Inc. There will be Christmas trees and wreaths for sale, gift items in the Christmas Shoppe, baked goods, chili to warm up guests, a model train layout, and an extensive collection of Nutcrackers—including Frankenstein. 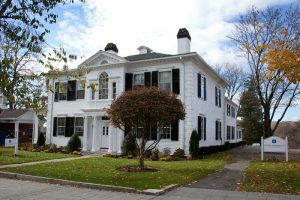 Another fixture at the trackside hotel and rest stop that opened in 1843, and has been undergoing a restoration since being rescued from near ruin in 1971, is Jeremy Ruman, president of the Board of Directors of the nonprofit organization Merwinsville Hotel Restoration, Inc. Restoring and choreographing a vibrant role for this piece of local railroading history is one of her passions. Her “day job” is serving as the legal assistant to Cramer & Anderson Partner Arthur C. Weinshank. Ms. Ruman handles all administrative aspects of Attorney Weinshank’s tax, estate and elder law planning practice and devotes a substantial amount of time to interacting with his clients. A vintage photograph of the hotel from the website of the Merwinsville Hotel Restoration, Inc.
“It’s a great historic building,” Ms. Ruman said of the Merwinsville Hotel, whose long and fascinating story is told on the Restoration’s website. “As you enter the Hotel today, you get a sense of what it was like 170 years ago as passengers stepped off the railroad on their way from Bridgeport, Connecticut, to summer homes in Pittsfield, Massachusetts,” the About section says in part. Jeremy Ruman, right, and her sister, Jennifer Haase, at the Merwinsville Hotel. “He really gathered the neighborhood together to save it,” Ms. Ruman said of her father. Now, she leads the Restoration board, and her sister, Jennifer Haase, is Vice President of the Board for the all-volunteer effort. Which makes it a perfect time for a visit—and to partake in the seasonal charm and festivities of the holiday show, which also features Dickens Villages and Worlds Fair Amusement Park Miniatures. There is no admission fee for the holiday show, which runs from 10 a.m. to 7 p.m. Friday, Dec. 2, and from 10 to 5 p.m. on Saturday and Sunday. The Merwinsville Hotel is located at 1 Browns Forge Road in the Gaylordsville section of New Milford. The phone number is (860) 350-4443 and the website is http://www.merwinsvillehotel.org. What the Merwinsville Hotel looks like today. Photograph from the website of the Merwinsville Hotel Restoration, Inc.
Jeremy Ruman may be reached by email at jruman@crameranderson.com or by phone at 860-355-2631, ext. 132.